A classic effect, the Jim Dunlop MXR Phase 90 Guitar Effects Pedal has found its way on to many pedal boards including those of Eddie Van Halen, Josh Homme, Jerry Cantrell, and Interpol, amongst countless other legendary players. Keeping things simple, this timeless effect gives you just one knob to alter the effect but that's plenty to play with. Wide and slow phasing is available down the lower end of the dial’s range. However, you can easily take it all the way up to produce a "ray gun" setting, which experimental guitarists will love. Perhaps one of the most versatile effects out there, the Phase 90 pedal sounds great clean or distorted and can be heard in rock, metal, jazz, funk and just about any other genre you can think of. The pleasing shallow shimmer can be ramped up to a swirling wobble. The pedal breathes life into your rhythm chops, adds character to your clean note picking, and another dimension to overdriven lead licks. The Phase 90 does wonder for the guitar, but it is remarkably adaptable too, lending itself beautifully to enhancing your bass guitar tone, keyboard, and vocals. The diminuitive footprint of the Phase 90 allows it to slot into any pedalboard setup discreetly. As we've come to expect from Jim Dunlop's MXR range, the chassis and all components are built to a considerably high standard of quality, making this ideal for gigging guitarist who demand the best. 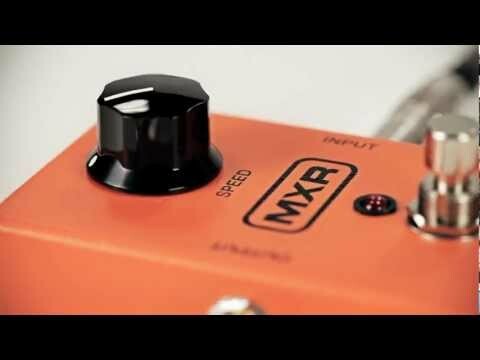 Powered by your choice of 9V battery or optional AC adaptor, the MXR Phase 90 is one of those pedals that you'll wonder what you did without it once it's part of your rig. Effective when used subtly or dramatically, there's not much this pedal can't enhance.